When searching for Atlanta Midtown Hotels, the Residence Inn Atlanta Midtown/17th Street is ready to be your home away from home. Perfect for short or extended stays in Atlanta, GA, our spacious suites include separate living and working areas, a full kitchen, flat screen TVs, and a renovated, modern decor. The Residence Inn Atlanta Midtown Hotel on 17th and Peachtree Street has all the amenities you need to make your stay as relaxing or productive as possible! Complimentary high speed wireless internet and free hot breakfast are available to all guests. With 3,000 sq ft of event space, you'll find the Residence Inn Atlanta Midtown to be ideal among nearby hotels for weddings, receptions, and meetings in Atlanta, GA. Plus, when it comes to value, we stand above other Atlanta Midtown hotels; we provide an evening reception each night & handle your grocery shopping for you while you explore Midtown. 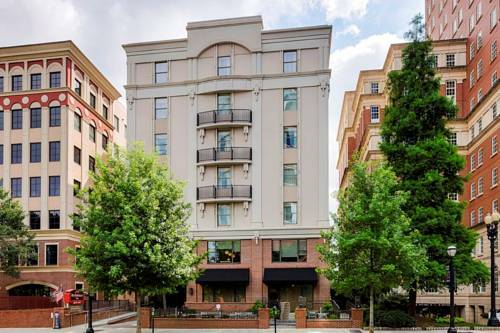 The High Museum of Art, Alliance Theatre, Atlantic Station, Center Stage, Fox Theatre & more are all steps away.